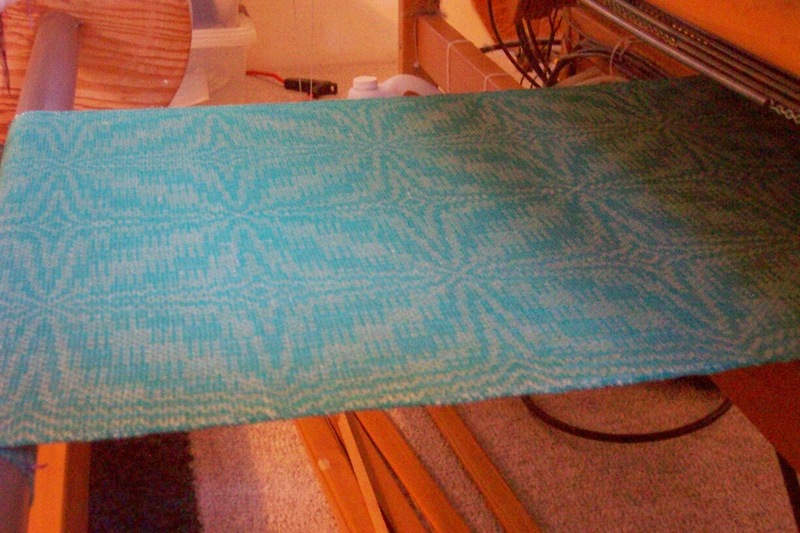 Well, here I am, still working on this Blooming Leaf tea towel warp. Just when I was starting to recover from the latest health 'crisis', I caught a cold. Between starting slowly, and then having zero energy today, weaving has been progressing - but at a snail's pace. However, I think I'm down to the last 5 yards of this 20 yard warp. And it looks like I will come very close to finishing off another cone of fine singles linen. I'm hoping that this cold will start easing tomorrow and that I will feel more up to weaving than I did today. Not that I haven't been productive. I accepted a transcribing job and in spite of feeling punky have been making my way through the interviews for Tien Chiu, who is writing a book on the creative process. Lucky me - I get to hear all those interviews! And I will certainly let people know when the book is ready because I have a feeling a lot of people might find what all the talented people Tien is interviewing will have to say. The looms have been quiet for a very long time but I am about to go fire up the AVL and see if I can weave again without triggering more issues with my lower back and hip. It is also quiet because a friend who came to visit for the weekend left on the early morning flight today. It was wonderful to have a fellow fibre addict in the house, to talk weaving, a little spinning, and Life. Her departure has left a big void. I'm used to leaving town on a regular basis in order to spend quality time with other fibre people. Being unable to travel due to health issues has been...difficult. Things are not back to 'normal' yet but at least I'm feeling like weaving has become possible, finally. And so I'm using the same photo as I did a few blog posts ago because nothing has progressed beyond where I was in terms of weaving. I'm really hoping that I can pick up the shuttle again. The fall shows are beginning in three weeks and I'd like to have a few more things ready. But if not, well, what is done is done and that will have to be sufficient. 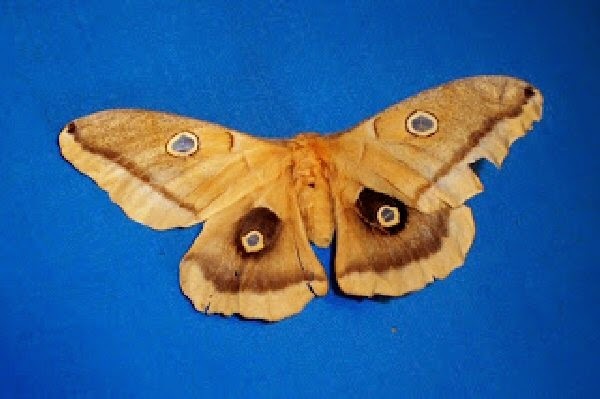 Even though they are all regenerated, some from cellulose, some from protein, they each have their own characteristics. I was most surprised at how slippery some of them are, although why that should be I'm not sure - they were developed to be silk substitutes, after all. If you ever have a chance to take a workshop with Kim, you will learn a lot about fibres and yarns. I'm hoping to become a better weaver by adding to my database of how fibres look, feel and function, in order to make better choices for my hand woven cloth. Cleaning up, Doug came across one of my old postcards I used for marketing eons ago. 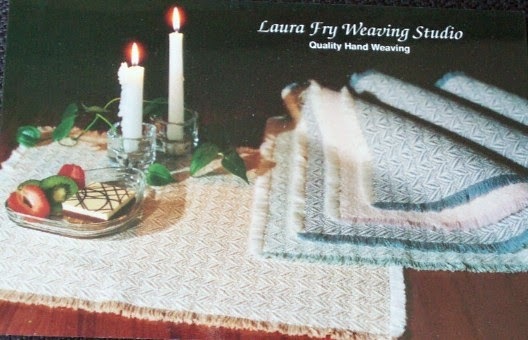 This was one of my more popular place mat designs which I wove by the 100's - literally. Warps were generally 40 yards long, woven 3 mats at a time or about 150 place mats from each warp. Nothing like finally digging into the piles of rubble to find stuff you'd long forgotten about! The reason for the clean up is that a friend was coming to visit and we needed her to be able to actually sleep in the bed in the guest room come office. Cindy arrived on time last night and today we spent a leisurely day sight seeing around the town. Autumn has arrived and over the next few days the colours should be pretty spectacular. It was also nice that the rain forecast for today arrived last night, so we had a really pleasant day wandering around, sight seeing. This afternoon I let her loose on the spinning wheel I borrowed for her to use at the workshop this weekend. I'm not a very good spinner, nor do I have any particular aspirations in that direction, so you might wonder why I signed up for a spinning workshop. Well, the topic, for one. Kim McKenna will be explaining the fibre characteristics of the new regenerated fibres. I figure anything I learn will be more grist for the mill in terms of my being able to make appropriate choices in my weaving. And who knows, she might be able to teach me how to spin more effectively. Although after putzing around on the borrowed wheel, I've come to realize that part of my problem is that I'm not getting sufficient twist into the fibres. Which would explain why my 'yarn' so often breaks as I'm trying to reel it off the bobbin. Always something more to learn when it comes to fibres, yarn and how to make better cloth. One of the benefits of the internet is the ability to stay in touch with people at a distance - sometimes at great distance. During the summer Bobbie Irwin came through town and we managed to connect with each other for an all too brief visit. As part of the visit I gave her a tea towel. And then things went to hell in a hand basket for me and I had a rocky road in terms of pain, finally ending up not being able to weave. Long story short, the road to recovery does not travel in a straight line and I had a relapse just as I was beginning to literally get back into the saddle and wound up worse than before. During the relapse a parcel arrived from Bobbie. We had talked about weaving with fine linen and more than 8 shafts and how much she was enjoying her new 12 shaft loom. She had told me about an old tea towel woven from fine linen she had found in a second hand store, how she analyzed it and converted it from 16 shafts to 12 so she could weave it. What a delight to receive such a special gift - one of the very fine linen towels we had talked about. Through this 'ordeal' - and the rest of the health issues I've shared on this blog - I have been so grateful to everyone for their support and encouragement. Through the internet - emails, Facebook, comments on the blog - I have been made aware of how many people are sending best wishes and positive healing energy my way. Soft tissue injury is dreadful. Once injured the tissues are never entirely whole and healthy again. It is one reason why I am so adamant about working efficiently/ergonomically. Once you have suffered repetitive stress injuries, those tissues will always be at risk for further improper or over use. So I say again - if it hurts - STOP! Rest. Allow the body to heal. The sad truth is that when the injuries pile up and age creeps in, healing takes longer. Sometimes much longer than we would like. Be kind to your body as much as you can. We only get issued with one. I just wish an owner's manual came along so that we would know how best to care for it. Spot Bronson in a point progression. The weave structure will 'pivot' so do not repeat the final block when repeating the threading or treadling. Bronson Lace. 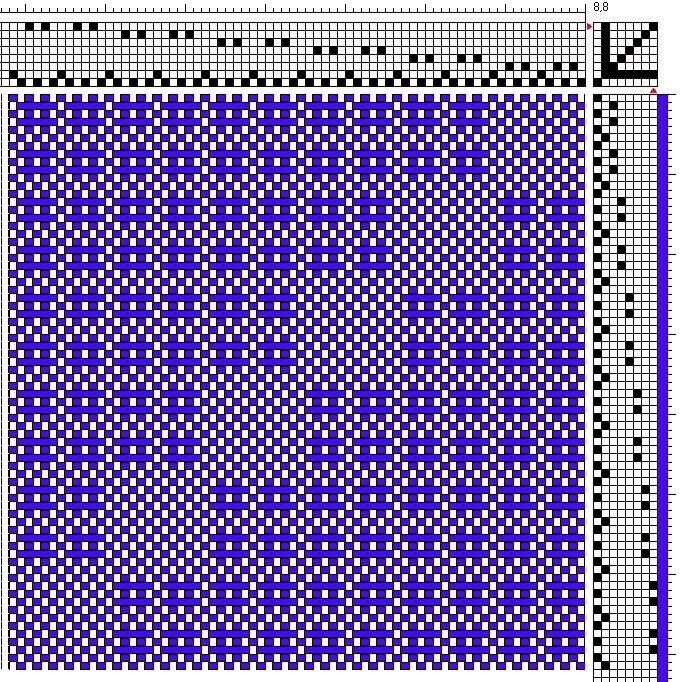 Half of one repeat shown. Again, do not repeat the 'pivot' blocks at the centre and end of the repeat. 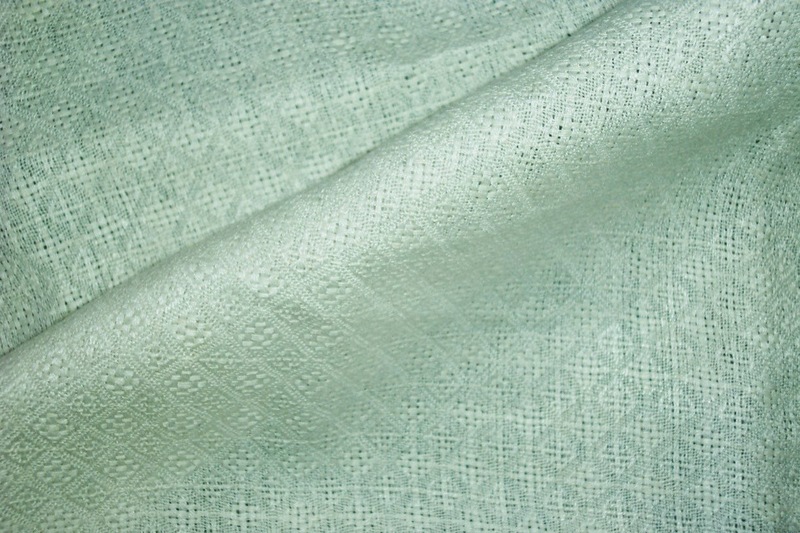 By weaving the cloth as mostly lace with just some plain weave, you lift a lot fewer shafts. But that much lace might be too much for the cloth desired. 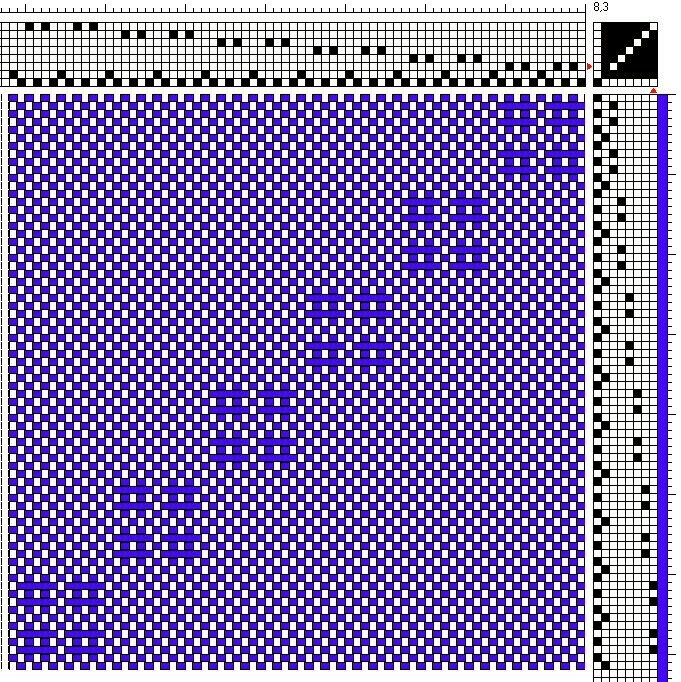 What differentiates Spot Bronson from Bronson Lace (or sometimes Atwater-Bronson) is that in order to get lace you have to have two units of the weave structure side by side both vertically and horizontally. The lace 'hole' happens at the intersection of the four units. 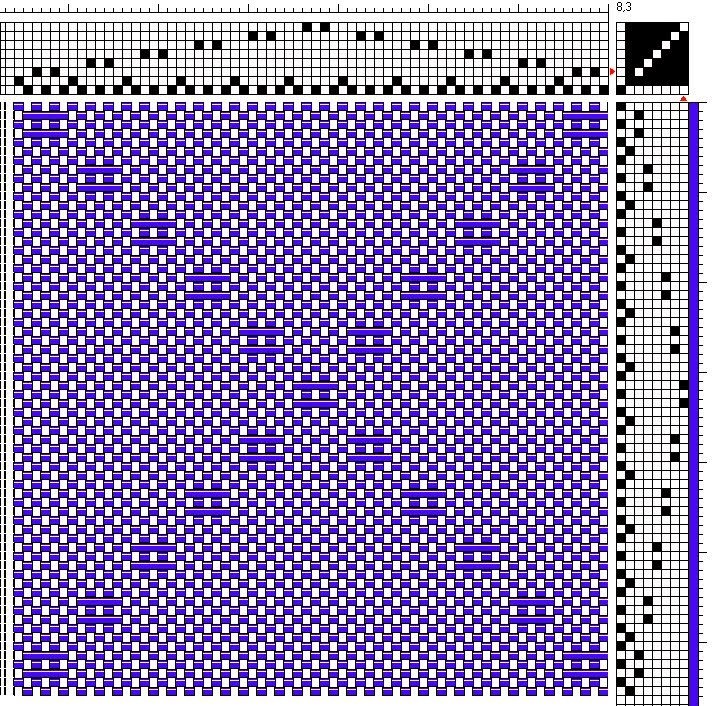 If there is only one unit of Bronson surrounded on all sides by plain weave that is considered a 'spot'. Got the next warp up and weaving. Blooming Leaf is a very large overshot design, so naturally it's a very large twill block design. So large that I could only fit two repeats into the width and three into the length. This isn't a very good photo, but the best I can do under the loom. Reading In Praise of Slow has got me thinking along with a thread on one of the chat groups. After nearly 40 years of refining my techniques, perfecting my skills, I'm rather efficient. Therefore I'm rather productive. But since my goal is to earn income from the fruits of my looms (pun alert!) efficiency and productivity are A Good Thing. What I am not, is in a contest. The only person I am competing with is myself, on a mission to become the best I can be. Bottom line is, I couldn't care less how fast/efficient anyone else is. Everyone has to do what is right for themselves. If that's working slowly, so be it. Some people tell me that they don't want to hurry when they are working with threads. I am in total agreement, on that point. I've said it before and I'll say it again - working efficiently is not hurrying. When you are hurrying it is because you are not in the moment but thinking about the next thing(s) that need to be done. When you are hurrying, you take shortcuts - which sometimes work, but most often do not and just cause something to take even longer. 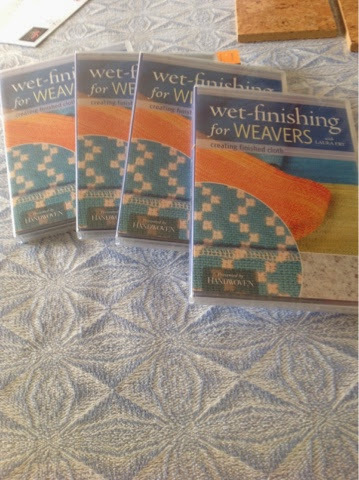 On the other hand, weaving cloth doesn't have to take forever. Not everyone has unlimited time on their hands. Some people work full time, have family obligations that eat into their play time at the loom. Some people have deadlines and they want to work more efficiently. I'm here to say that it doesn't have to take forever to make a baby blanket, a wedding shawl, a birthday present. Learn the most effective methods for you - what works for me may not work for anyone else. Select the tools that enhance your experience at the loom, not detract from it. Believe me there are some tools that don't work terribly well. Find tools that 'fit' you. Find methods that work for you. Work with mindful intention to become better than you were yesterday and the day before. And if you want to become more efficient, study the processes, methods and tools that someone who is efficient uses and try them out. It may be difficult being at the slippery end of the learning curve, but in the long run? You might just enjoy the process even more than what you are doing now.